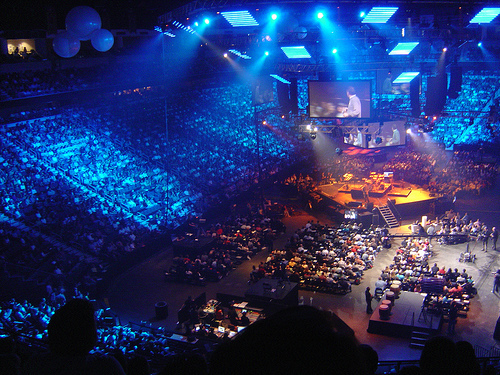 In October of 2010, 13,000 zealous Christian leaders gathered and talked about changing the world. This study applies some of the tools of the sociology of religion to an understanding of the organization behind this gathering, Catalyst. The research that informs this work includes participant observation at the annual Catalyst East Conference in Atlanta, Georgia on October 5-7, 2010, analysis of Catalyst’s presence on the internet, attention to participant comments via Twitter and relevant written sources. The primary questions pursued in this research center around the posture of Catalyst and those who affiliate with it toward the wider culture. In this respect, the work of Christian Smith and others on American evangelicals has proven immensely helpful. Catalyst began as the Next Generation Leaders Conference in 2000 hosted by Andy Stanley, the Senior Pastor of evangelical megachurch North Point Community Church in Atlanta, GA, which has 23,000 people in attendance each weekend. 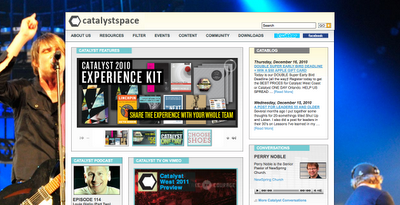 Catalyst was created to address a felt need for a church leadership event for those under 40. This is felt need grew in contrast to the extant Leadership Summit put on by the megachurch Willow Creek that caters primarily to baby-boomers. The now Global Leadership Summit was born in 1995 and today boasts, via simulcast events, a single-conference reach of “350 cities across 76 countries, challenging more than 120,000 leaders from 10,000+ churches!” While modest by comparison, in the last decade, the annual Catalyst conference has grown remarkably from 1500 to 13,000 with over 90,000 total participants since its inception. Rather than following the simulcast path laid by the Global Leadership Summit, in recent years, Catalyst has launched mini-conferences, which replicate the focus on topics such as organizational leadership, integrity, relationships, teamwork, and innovation across the country. It should be noted that these are “not your father’s” conferences. Catalyst events are known for the wild and crazy. From randomly dotting the lawn with flamingos to launching a man from a human canon, the Catalyst experience is something like youth retreat on steroids. This penchant for the fun even shapes the job titles of Catalyst staff, which include Quarterback of All Things Catalyst and Catalyst Special Projects Ninja. In addition a burgeoning set of conferences, Catalyst has expanded to be a brand that offers resources, an online community, an active blog, and bi-weekly podcasts. Connections to this pluriformity can be made from www.catalystspace.com. Catalyst articulates several of its core values. Passion for Jesus Christ is primary because it fuels ones “thinking, living and leading.” Leadership is defined as influence and Catalyst wants to maximize it. In contrast to the “moral relativism that permeates the next generation’s mindset,” Catalyst lifts up the “unchanging truth of God’s Word.” Relevancy is the language of choice for bringing an “ageless message to a changing culture.” The Local Church is deemed to be the primary vehicle of reaching next generation leaders. Via Transference, Catalyst encourages and equips young leaders to pursue the life-on-life connection with other generations for the purpose of transferring wisdom from one generation to the next. Most Catalyst attendees are young white men who work at churches. The pie charts below illustrate demographic information for those who registered for Catalyst East 2009, provided by one of Catalyst’s administrators. The age of attendees is quite young with 78% under 46 (14% were 25 & under, 38% were 26 – 35, 26% were 36 – 45, 18% between 46 – 55, and only 5% over 55.) Sixty-nine percent of attendees were male. In terms of employment, 13% were senior pastors, 12% work as youth/students pastor, another 43% in other roles as church staff with the remaining 33% employed as professionals of another type. The racial make-up of attendees was overwhelmingly Caucasian. In two separate periods of counting passersby in a high-traffic areas I noted ratios of whites to non-whites of 55:6 and 167:8. Without further elaboration, the administrator also informed me that 2009 registrants came from all over the US – a fact that my conversations with 2010 attendees confirmed. Also noted in the dozens of informal interactions I had with 2010 attendees was the diversity of denominational affiliation and church size. Sizes ranged from super-mega-churches to house-sized church plants. Affiliations included all forms of Baptists and mainline denominations, many non-denominational churches and a smattering of Charismatic and Pentecostal groups. One of the most important questions to be asked is whether these attendees share the perspectives of Catalyst’s organizers and speakers. While survey work would be the preferable method for discerning the degree of solidarity between Catalyst and those who attend, I was able to observe several signs, all which pointed toward unanimity. These were apparent largely through the attendee’s activity on Twitter and their apparel. I have highlighted these indications throughout in what follows. While Catalyst provides no statement of faith, its theology is largely reflected in the speakers who are invited, though they certainly represent a spectrum of views. The table below lists some of indicative keynote speakers throughout Catalyst’s brief history. Other Notables: Brian McLaren (2004), Bill Hybels (2005), Rick Warren (2007), Billy Graham (2008), George Barna (2006), Chuck Colson (2004), Malcolm Gladwell (2009), Chuck Swindoll (2009), Shane Claiborne (2007), Patrick Lencioni (2007), John Eldridge (2004), Ken Blanchard (2001), Gary Haugen (2006), Beth Moore (2010), T.D. Jakes (2010), Jud Wilhite (2009), Stephen Furtick (2008), Tony Dungy (2009), and Eugene Peterson (2010). As any insider to American evangelicalism can tell you, this is a who’s who list of influential evangelicals of various generations, especially stocked with mega-church pastors. This list alone is enough to suggest that its coordinators embrace the set of beliefs that are typical of American evangelicals. This, of course, would imply Catalyst, as an organization, is “evangelical”. And yet, I didn’t come a single instance of Catalyst describing itself as “evangelical,” either on the internet, in their print materials or from the conference stage. What is going on here? Are they evangelical, or not? Answering the above questions depends entirely on how “evangelical” is defined, and how they are isolated in order to study them. Christian Smith, a rock-star Sociologist of Religion who has conducted significant research on evangelicals, surveys the approaches to a similar question with regard to conservative Protestants in Christian America? : What Evangelicals Really Want. The three he outlines are: 1) designating people who attend churches in conservative Protestant denominations as conservative Protestants; 2) employing a theological criteria—a set of beliefs that conservative Protestants are assumed to hold and; 3) allowing conservative Protestants to self-identify. Smith favors the third approach and uses it throughout his work. While in theory I share this preference for discovering what evangelicals believe and do, to take this approach with Catalyst would rule out the application of a whole body of research that I am convinced will be highly relevant and useful, since Catalyst as an organization is not professedly "evangelical". For this reason, this study will favor the second approach, identifying evangelicals on the basis of a set of shared beliefs as evinced by the leadership and especially the invited keynote speakers. What might this uniting set of beliefs be? The Gallup scale, according to Smith, is one of the most widely used in surveys and “defines an evangelical as someone who (1) holds a literalistic interpretation of the Bible, (2) has had a “born-again” experience, and (3) has evangelized others with the Christian gospel.” (10). While a useful list, it is questionable whether biblical literalism ought to be definitive, and whether “born-again” language is much employed by younger evangelicals. The categorization used by the Barna Group is, in my view, preferable. While 38% of the US population accepts the label “evangelical” for themselves, only 8% affirm the nine beliefs that Barna considers definitive: 1) Satan is real, 2) salvation is based on grace through faith, 3) I have a personal responsibility to share my religious beliefs with others, 4) faith in God is a top priority in my life, 5) Jesus Christ lived a sinless life on earth, 6) the Bible is totally accurate in all its teachings, 7) I will go to Heaven because I have confessed my sins and accepted Jesus Christ as my savior, 8) I have made a personal commitment to Jesus Christ that is still important in my life today, and 9) God is the all-knowing, all-powerful, perfect deity who created the universe and still rules it today. Using this rubric, Barna notes strikingly higher rates of personal Bible reading and church attendance, as well as greater likelihood to have conservative political views, to have graduated from college, to be married, to be white and to have a higher income among 9-point evangelicals than self-described ones. With the possible exception of conservative politics, my observation of Catalyst attendees and speaker generally lines up with those of these markers that were evident; they were mostly married, white, well-educated and fairly well-off. While it was impossible within the scope of this project to interview Catalyst staff and keynote speakers regarding these beliefs, I am convinced that the overwhelming majority of these would affirm the above nine statements. This confidence is based on my personal acquaintance with their writing and speaking as well as on their reputations in evangelical circles as theologically orthodox. The notable exceptions would be the non-religious speakers who Catalyst invites to speak on topics of leadership and innovation. Another source validating Catalyst as an expression of evangelicalism comes from Robert Webber, professor emeritus at uber-evangelical Wheaton College. His insightful The Younger Evangelicals, highlights a number of characteristics of this group that are consistent with those of Catalyst. First, young evangelicals “stand for the absolutes of the Christian faith in a new way” and are “attracted to absolutes.” This propensity is seen in Catalyst’s critique of moral relativism and commitment to the “unchanging truth of God’s Word.” Second, as will developed later, younger evangelicals have “facility with technology.” Catalyst uses technology with a savvy that rivals internet start-ups, employing every means available including apps, blogs, tweets, podcasts, and a web-version of the popular Christian magazine Leadership. Moreover, the aesthetic of their web and print materials reveal an appreciation for beauty and design, resonating with another of Webber’s characteristics. Finally, younger evangelicals “demand authenticity,” something that Catalyst lists as the top trait of a leader. Why then, if Catalyst holds a set of beliefs and values consistent with evangelicalism, does it shun the label? A major clue to the shedding of the “evangelical” brand is found in the research behind UnChristian, authored by David Kinnaman, president of the Barna Group, and Gabe Lyons, co-founder of Catalyst. Among those between the ages of 16 and 29 who do not attend church and who recognize the term “evangelical,” the ratio of negative to positive reactions” among was a devastating 16:1. 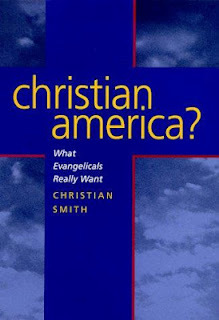 In the words of Christian Smith “American evangelicals have a serious public relations problem.” It is not unreasonable, therefore, given the widespread disrepute “evangelicalism” in mainstream culture, to believe that the new generation of evangelicals represented by Catalyst have, for the sake of their mission of engagement, abandoned the label while retaining the core ideals. In fact, this sentiment was expressed in a behind-the-scenes conversation between Gabe Lyons and John Ortberg, a well-known evangelical author and a Catalyst speaker. Ortberg mentioned that “evangelical” was a label he was comfortable with and asked Lyons if it still fit. Lyons suggested that the next Christians most often prefer a broader label such as “Christian.” Others have suggested that this new breed, given the disrepute of institutional Christianity and ongoing popularity of Jesus (such as Dan Kimball articulates in They Like Jesus But Not the Church), prefers to be designated as simply “Christ follower” distancing themselves even further from the religion, and aligning themselves with Jesus. Evangelical approaches to the influence of religion in the public square tend to run in cycles, so the dominant evangelical worldview in one decade may be quite different from that of the previous decade or the decade to come. While Catalyst and its younger breed of evangelicals seem to have opted to drop the term for the sake of the cause, they nonetheless share the same basic evangelical understanding of the faith and same orientation toward the world, as we will see. In summary, Catalyst can be understood as a rallying point for a new generation of anonymous evangelicals. With this established, we will proceed to apply some of the major insights of the work Christian Smith and others on evangelicalism to an understanding of Catalyst’s view of the proper relationship between church and culture. Click through to my reviews of Christian Smith's American Evangelicalism: Embattled and Thriving and Christian America? What Evangelicals Really Want. Kinnaman, David and Gabe Lyons. UnChristian: What a New Generation Really Thinks about Christianity…and Why it Matters. Grand Rapids, MI: Baker Books, 1997. Lyons, Gabe. The Next Christians: The Good News About the End of Christian America. New York, NY: Doubleday, 2010. All uncited quotations regarding Catalyst’s vision, purpose, values etc. come from www.catalystspace.com, accessed 12/12/2010. This racial homogeneity in an evangelical setting is fairly typical as Smith and Emerson demonstrate in Divided by Faith: Evangelical Religion and the Problem of Race in America, yet, it does run counter to the characteristic Robert Webber attributes to younger evangelicals who he describes as “committed to multicultural communities of faith” (54). Most of these interactions occurred at Monvee sponsored events, and while I do not believe this heightened the denominational diversity of those I met, the proportion of church staff to other professionals was likely affected. Christian Smith, Christian America? : What Evangelicals Really Want (Berkeley, CA: University of California, 2000) 16. Robert Webber, The Younger Evangelicals: Facing the Challenges of the New World (Grand Rapids, MI: BakerBooks, 2002) 54. David Kinnaman and Gabe Lyons, UnChristian: What a New Generation Really Thinks about Christianity…and Why it Matters (Grand Rapids, MI: Baker Books, 1997) 25. Christian Smith, American Evangelicalism: Embattled and Thriving (Chicago, IL: University of Chicago Press, 1998) 186. Kevin Christiano, William Swatos Jr., and Peter Kivisto, Sociology of Religion: Contemporary Developments, Second Edition (Lanham: Rowman and Little Field Publishers, Inc., 2008) 20. Thanks for the comment, Casey. If you have a chance to read the other posts, you'll see monvee makes an appearance. You don't need a poll to see Christians are sick of being 'tricked' into giving money to an organization that doesn't have to report income to anyone....maybe sick isn't the right word....wise to the fact...this is going to be a big issue for politicians in the next few years.Thanks to blogs and social media. Wilson-I'm not sure what relation you see between your comment and this post but I don't see it.